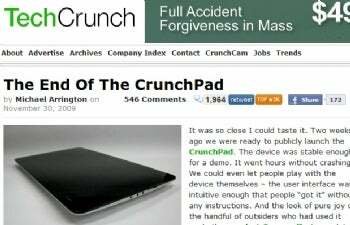 Michael Arrington's CrunchPad, a dream device that would allow quick and easy Internet access on a touch screen tablet, is vaporware indefinitely, but not for the cost-related reasons you'd expect. In a lengthy explanation, the TechCrunch founder said "the entire project self destructed over nothing more than greed, jealousy and miscommunication." In short, partner company Fusion Garage, its chef executive Chandra Rathakrishnan and its shareholders decided, according to Arrington, it would rather sell the 12-inch, Atom-based Web tablet without Arrington and his CrunchPad branding. There are more details you can read, and Arrington said TechCrunch "will almost certainly be filing multiple lawsuits against Fusion Garage, and possibly Chandra and his shareholders as individuals, shortly." I feel sorry for Arrington that things ended this way, but hasn't this project been doomed for some time now? Originally, the target price tag was $200, but it then ballooned to $300. A later report by Straits Times estimated a street price of $400. At that point, it was easy to write off the CrunchPad as a niche product for Silicon Valley geeks. Arrington addressed some of the price issues in his tell-all, but it seems too good to be true. Investors were lined up. A "major multi-billion dollar retail partner" was going to initially sell the CrunchPad at zero margins, pay for the devices on order and ship them from China on their own planes to cut costs. Intel, meanwhile, was providing "ridiculously generous" pricing on its Atom chips, Arrington claims, and other partners were willing to help for little or no benefit, just to support his pet project. Sponsors would help seal the CrunchPad's "near ... $300ish cost." But here's the kicker: All of this apparent good will from retailers, sponsors and tech companies stands on a concept that is unproven. No one knows whether consumers will want a couch-bound Internet tablet, and while Apple may be able to invest in something like that, the CrunchPad relies on too many moving parts from companies that are being eerily friendly. The tablet would have to go mainstream for all those companies to make their money, and that's a big "if." So maybe this turn of events is for the best. It'll give Arrington time to re-evaluate the market and see whether a 12-inch Internet tablet is viable. But by the time the legal mess is resolved, will anyone care anymore?